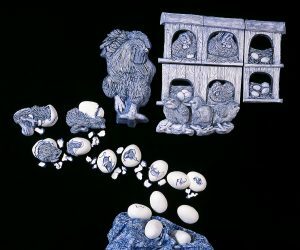 Rooster, Hens and Chicks in ceramic from images copyrighted by me from a book I illustrated by Millicent Selsam called "All About Eggs". The book is now out of print, but my illustrations have been inspiration for making 3D architectural ceramic pieces. These hang on a wall made in 17pieces. I've made plaster press molds of these so they can easily be reproduced and glazed in different ways. These are cartoony images of my kids with puppets. This is one of my first attempts to print my illustrations onto clay. I created a silkscreen from a sketch, screened it only a plaster slab with under glaze and poured clay slip over the images. 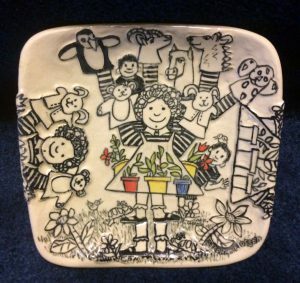 The slip picks up the imagery and allows you to apply it to the rolled out clay platter. Then I added more puppets and an extra little brother, etc. for fun.